I wrote about The Cat Machine a couple of months ago, and now The Cat Machine is a game that you can buy, own and play—likely in that order. 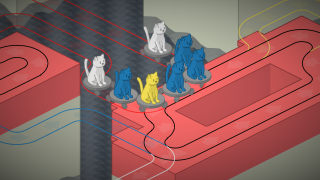 It's a puzzle game about logic and cats, in which you must send trains of felines around custom built and same-coloured tracks in order to fling them into the air so as to keep the Earth in stable orbit. Logic! It's a light-hearted affair, but with the potential for some infuriating difficult puzzles down the line. I haven't got that far yet, having only just jumped out of Tutorial Station. Nevertheless, there's some definite promise. And a science cat called Science Cat. Here's the Steam page. The Cat Machine is 10% off for the next 30 minutes—because it was actually released last week, and I'm only just getting around to posting about it.